American Mark Hough lives near Los Angeles, California. He was just about to start his weekend with an alcoholic drink called a margarita and a dip in his hot tub. Then, he heard sticks breaking and leaves moving in his backyard. At first, he thought the sounds were coming from his neighbor. But then, the noise grew louder. "So I got up, looked over in the bushes and lo and behold there's a bear climbing up over my fence," Hough said. After seeing the bear, Hough decided to go back into his home for safety reasons. When Hough looked outside a short time later, the bear had made himself at home in Hough's backyard. The bear had entered Hough's unheated hot tub. It played with the pool's thermometer, tossing the device in the air. "He was playing, having a grand old time," Hough said. Hough found his phone and began recording video of the bear's activity. After a few minutes of pool time, the bear got out and walked slowly around the yard. Then it made its way over to Hough's margarita. The bear pushed the drink over and drank it off the ground. Later in the day, Hough was talking to a neighbor when some tree leaves fell to the ground. Hough looked up to see the bear sleeping in the tree. "So he had his margarita, he had his Jacuzzi, and now he's ready for an hour nap," Hough said. Hough's video of the bear's relaxing afternoon has gone viral on social media. One Twitter user said the bear is "clearly having a better summer than you." Other users called the bear a "summer hero." One called it her "spirit animal." And one local news station in Iowa suggested the bear's activities would be a great way to celebrate America's Independence Day. 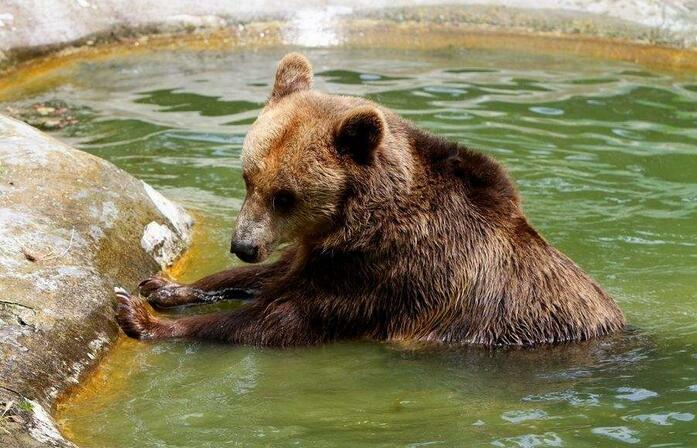 "This bear has the right idea for #4thofJuly -- margaritas and swimming." We have all witnessed the power of social media. A group of photos of a newborn baby holding an oxygen mask by himself has gone viral on Chinese social media. Too much alcoholic drink will contribute to your ruin. We sat in a car looked outside can see house and fields. 5.When Hough looked outside a short time later, the bear had made himself at home in Hough's backyard. A short time later they sat down to eat. A short time later, we received suggestions from around the world. 6.Hough looked up to see the bear sleeping in the tree. He looked up to the sky for a while. My husband has taught for thirty years, and all his students looked up to him.